Audiobus, the popular app-to-app audio routing solution used by hundreds of iOS apps including Apple's GarageBand, has been updated today to version 2.0, which brings further improvements to the app's inter-app communication capabilities. 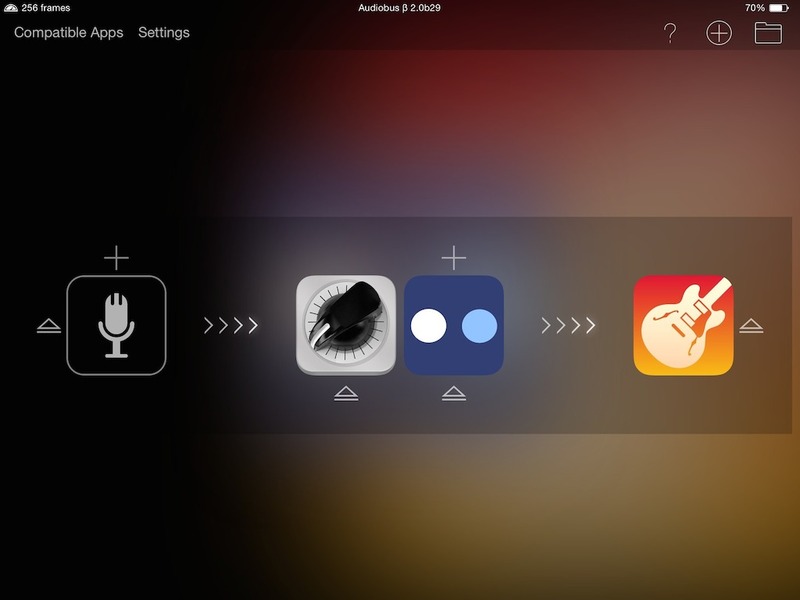 Audiobus, first released in late 2012, allows iOS apps to communicate with each other to exchange effects and sounds in a unified audio pipeline that lets users create a single audio stream from multiple apps at the same time. In Audiobus 2, a new feature called Multi-Routing can manage multiple audio pipelines for unlimited connections or effect chaining (depending on the hardware of a device). When chaining multiple effects in a pipeline, Audiobus will display a menu to choose a compatible app, which will open and add an effect on top of an existing one, creating a chain of effects in the middle of the Audiobus interface. The feature can be combined with multi-channel input hardware support, also new in version 2.0 of Audiobus. Also new in Audiobus is the ability to save presets with state saving. Presets allow users to save specific configurations of pipelines and effect chains to be reused in the future, which can be shared with others directly from the app. State-Saving will enable apps to save configurations as part of an Audiobus preset -- entire sets of app preferences can be recalled without having to tweak an app's settings every time a preset is loaded. The combination of presets and State-Saving aims at reducing the time spent changing settings in Audiobus-enabled apps, so users can focus on playing music or recording audio. State-Saving is currently being tested through a beta SDK with selected apps, and the functionality hasn't been added to the public SDK yet; developers that want to test it can get in touch with Audiobus today to request access. According to Audiobus, "more than a dozen apps already support the new State-Saving feature, including Nave, JamUp, Swoopster, Sector and DM1." Audiobus 2 is available on the App Store, and, with the exception of State-Saving, an updated SDK isn't required for third-party apps; Multi-Routing (pictured above) is available as an In-App Purchase at $4.99.